Background: There is limited data about current utilization of miniscrews in orthodontic practices in India. The purpose of this survey was to obtain information on clinical utilization of miniscrews among orthodontists in India. Materials and Methods: A survey questionnaire was prepared and mailed to 2100 qualified and registered orthodontists in India. Results: A total of 1691 orthodontists responded to the survey, with a response rate of 80.52%. Among them, 952 (56.3%) had never used miniscrews in their clinical practice. Seven hundred and thirty-nine (739) (43.7%) had utilized miniscrews in their treatment, at some point of time. Among the orthodontists who used miniscrews, 463 (62.65%) used a surgical guide for positioning the miniscrews and 276 (37.35%) placed miniscrews without a surgical guide. Six hundred and thirty-four (634) (85.79%) orthodontists placed the miniscrews personally while 105 (14.21%) utilized the help of other specialists for placing the miniscrews. Among the orthodontists who used miniscrews, 76 (10.28%) utilized the help of oral surgeon to place the miniscrews while 29 (3.93%) utilized the help of periodontists to do the procedure. Conclusion: Miniscrews are a useful addition to the orthodontic armamentarium. The major indication for miniscrew was indirect anchorage in critical anchorage cases. The most important factors in determining the clinical utilization of miniscrews as a part of the treatment modality depends upon operator training and skill; fear of complications, patient refusal to accept miniscrews and the clinician's preference for conventional methods without unnecessary invasive procedure. Limitations of traditional treatment modalities have been overcome with the advent of miniscrews. These screws are low profile, easy to insert and remove, can be loaded immediately after insertion, and can provide absolute anchorage for many orthodontic procedures. ,, They are used in high anchorage cases, uprighting molar teeth,  periodontally compromised condition where the molars cannot provide sufficient anchorage,  molar intrusion, , protraction of molars,  management of ectopic molars. Miniscrews less than 1.5 mm diameter have been employed for various orthodontic indications. , The aim of this study was to evaluate miniscrew utilization as a treatment modality among orthodontists in India. The study was developed and approved by the institutional review board of Priyadarshini Dental College and Hospital at Pandur, Thiruvallur, India. A survey questionnaire was sent to 2100 qualified orthodontists practicing in India. The questionnaire was broadly divided into two sections. Miniscrew utilization in clinical practice. If the respondent had used miniscrews in clinical practice, the questions required to be answered in the survey were; indications for treatment with miniscrews, miniscrew placement under topical or local anesthetic, personal placement or referral to other specialist, immediate or delayed loading of miniscrews, miniscrew complications, and utilization of surgical guide for miniscrew placement. If the respondent had never used miniscrews, the reasons for not employing miniscrews in their orthodontic practice, was required to be filled in the questionnaire. Blinded annotated data were obtained for statistical analysis. Cross-tabulations were performed as appropriate and the significance of observed differences was assessed by means of the chi-square, Wilcoxon rank-sum, or Fisher exact test as appropriate. A "P" value of 0.05 or less was considered to be statistically significant. Respondents were distributed geographically among all the states of India. A total of 988 respondents practiced in an urban setup while 723 had practice in a semi urban or rural locality. Among the urban orthodontists, 537 had used miniscrews while among the orthodontists practicing in a semi urban/rural set up, 202 had used them. There was more miniscrew usage among respondents of urban setup practice compared to semi-urban or rural locality practice. However, it was not statistically significant. 56.3% respondents (952) had never used miniscrews while 43.7% respondents (739) had utilized miniscrews in their clinical practice. 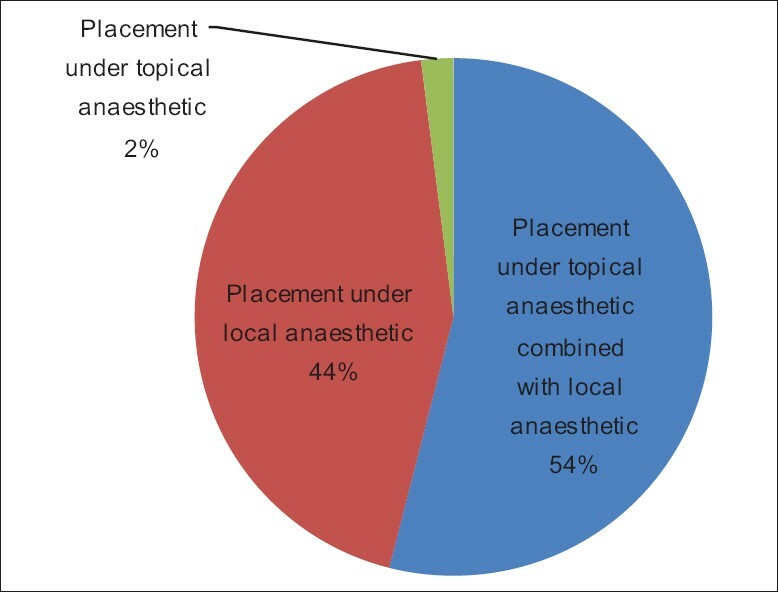 Among the respondents who had utilized miniscrews, 54% placed the miniscrews under topical anesthetic combined with local anesthetic, while 44% placed them under local anesthetic and 2% placed them under only topical anesthetic [Table 1]. 85.79% practitioners (634) placed them personally while 14.21% (105) sought referral to other specialists for placement [Figure 1]. Of the 105 who had referred patients for the procedure, 76 (10.28%) had referred to oral surgeons and 29 (3.93%) had referred to periodontists. Among the 739 who had used miniscrews, 436 (59%) used a surgical guide for positioning the miniscrews, while 303 (41%) placed the miniscrews directly without the help of a surgical guide. Among the respondents who used miniscrews, 692 (93.6%) applied force immediately on to the miniscrews, while 47 (6.4%) respondents delayed the force application for at least 1 week to allow the miniscrews to stabilize. The reasons given by orthodontists for not using miniscrews in their clinical practice were lack of training (67%), fear of risk factors like root damage and infection (54%), patient refusal or inability to convince patients to accept miniscrews (29%), not encountering any case requiring miniscrew placement (14%), preference for conventional methods of treatment without unnecessary invasive procedures (5%), and cost factor (1%). 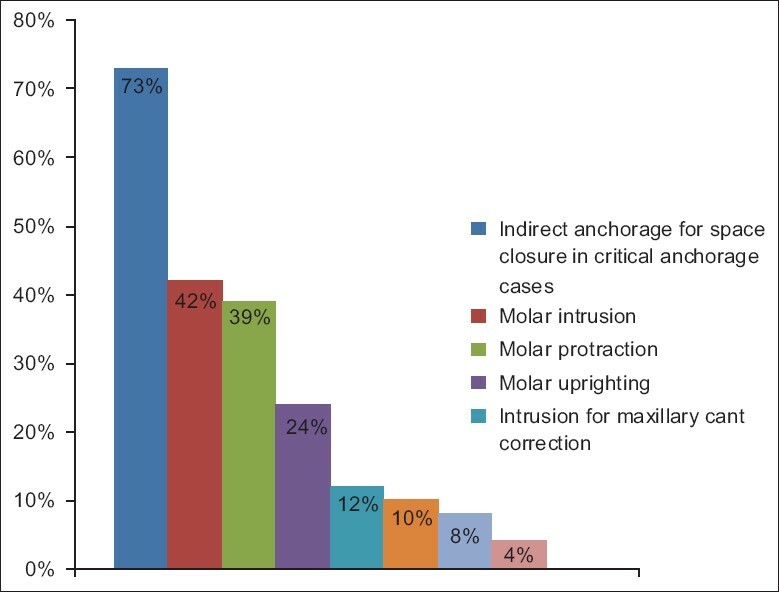 The main indication for treatment with miniscrews were indirect anchorage for space closure in critical anchorage cases (73%), followed by molar intrusion (42%), molar protraction (39%), molar uprighting (24%), intrusion for maxillary cant correction (12%), molar distalization (10%), traction of impacted canines (8%), traction of impacted molars (4%) [Table 2] and [Figure 2]. A panaromic radiograph was the most commonly used diagnostic tool to guide miniscrew placement. 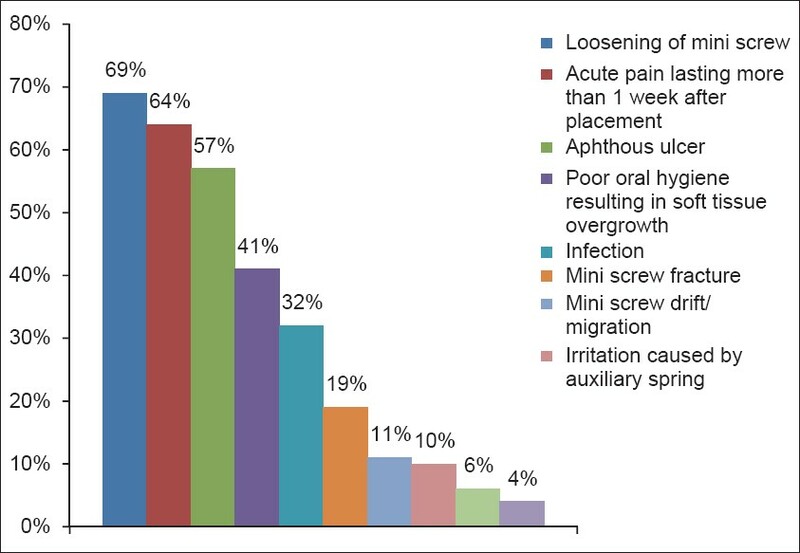 The most commonly reported complication of miniscrew treatment were miniscrew loosening (67%), acute pain lasting more than 1 week after placement (64%), and aphthous ulcer (57%) [Figure 3]. 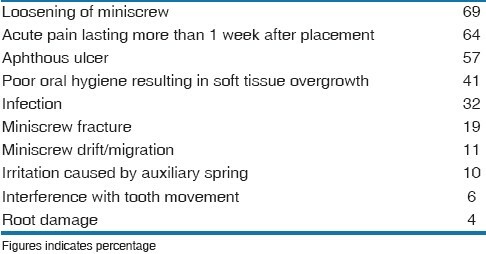 The other complications frequently reported were poor oral hygiene resulting in soft tissue overgrowth (41%), infection (32%), miniscrew fracture (19%), miniscrew drift/migration (11%), irritation caused by auxiliary spring (10%), interference with tooth movement (6%), and root damage (4%) [Table 3]. There were no reported cases of maxillary sinus perforation on miniscrew insertion. The proportion of respondents, in our survey, who utilized miniscrews in their clinical practice, was 43.7%. This is much lower compared to the results of 60.7%,  80%,  and 91%  in other surveys. Optimal positioning has always been critical to the effectiveness and success of miniscrews. A surgical guide provides three-dimensional surgical bur control, for accurate placement of self-tapping orthodontic mini-implants, at the desired location and angle. Other surveys have not evaluated the use of surgical guide for miniscrew placement in their questionnaire. Among orthodontists using miniscrews in their practice, 59% used a surgical guide to facilitate miniscrew placement, in our survey. The major treatment indications for miniscrews were indirect anchorage in critical anchorage cases (73%), molar intrusion (42%), and molar protraction (39%). This is different from the results obtained in other surveys , where the most common indication was for molar intrusion and molar protraction. In the survey done by Hyde et al,  the major indications were Molar protraction, indirect anchorage and intrusion of supra erupted teeth. Molar intrusion, open bite, and class II were the major indications according to the survey done by Keim et al. In the survey done by Buschang et al.,  the major indications were bodily movement, molar uprighting, and intrusion. The major reasons given by orthodontists for not utilizing miniscrews in their practice were lack of training (67%), fear of risk factors like root damage and infection (54%), and patient refusal to accept miniscrews (29%) [Table 4] and [Figure 4]. In the survey done by Buschang et al.,  only 13% cited lack of training while 16.3% felt they could achieve the same results with other systems and 4.3% believed the procedure was too invasive. The major complication associated with miniscrew usage were loosening of miniscrew (69%), which is similar to the results of other surveys. , The other complications were acute pain lasting more than 1 week after placement (64%) and aphthous ulcer (57%). This is different, compared to the soft tissue overgrowth and irritation from auxillary spring, listed as the other major complications in the survey done by Hyde et al. Soft tissue overgrowth adjacent to miniscrew insertion site was reported by 41% orthodontists in our survey. The major drawback while using miniscrews appears to be failure due to miniscrew loosening. The reason for loose screws appears to be multi-factorial and is a disconcerting and unpredictable reality which we have to embrace in our clinical practice. The major reason cited in the survey, for not using miniscrews in their clinical practice, is lack of training and fear of risk factors including root damage. Combined with our findings, these data suggest that orthodontists need to have adequate training in miniscrew insertion technique and knowledge of the factors responsible for clinical success of miniscrews. They must also be aware of the potential risk for soft-tissue complications, particularly when associated with poor oral hygiene and that this area provides ample scope for further investigation and research. 1. Park HS, Jeong SH, Kwon OW. Factors a affecting the clinical success of screw implants used as orthodontic anchorage. Am J Orthod Dentofacial Orthop 2006;130:18-25. 2. Kanomi, R. Mini-implant for orthodontic anchorage. J Clin Orthod 1997;31:763-7. 3. Costa A, Raffaini M, Melsen B. Miniscrews as orthodontic anchorage: A preliminary report. Int J Adult Orthod Orthognath Surg 1998;13:201- 9. 4. Kyung HM, Park, HS, Bae SM, Sung JH, Kim IB. Development of orthodontic micro-implants for intraoral anchorage. J Clin Orthod 2003;37:321-8. 5. Lee KJ, Park YC, Hwang WS, Seong EH. Uprighting mandibular second molars with direct miniscrew anchorage. J Clin Orthod 2007;10:627-5. 6. Dimitrios M. Management of a periodontally compromised case using miniscrew anchorage. J Clin Orthod 2006;12:725-2. 7. Bae SM, Kyung HM. Mandibular molar intrusion with miniscrew anchorage. J Clin Orthod 2006;2:107-8. 8. Lin JC, Liou EJ, Yeh CL. Intrusion of overerupted maxillary molars with miniscrew anchorage. J Clin Orthod 2006;40:378-83. 9. Kyung SH, Choi JH, Park YC. Miniscrew anchorage used to protract lower second molars into first molar extraction sites. J Clin Orthod 2003;37:575-9. 10. Giancotti A, Muzzi F, Santini F, Arcuri C. Miniscrew treatment of ectopic mandibular molars. J Clin Orthod 2003;37:380-3. 11. Bae SM, Park HS, Kyung HM, Kwon OW, Sung JH. Clinical application of microimplant anchorage. J Clin orthod 2002;36:298-302. 12. Keim, RG, Gottlieb EL, Nelson AH, Vogels, DS III. 2008 JCO study of orthodontic diagnosis and treatment procedures, part 1: Results and trends. J Clin Orthod 2008; 42:625-40. 13. Buschang PH, Carrillo R, Ozenbaugh B, Rossouw PE. 2008 survey of AAO members on miniscrew usage. J Clin Orthod 2008;42:415-8. 14. Hyde JD, King GJ, Greenlee GM, Spiekerman C, Huang GJ. Survey of orthodontists' attitudes and experiences regarding miniscrew implants. J Clin Orthod 2010;44:415-8. 15. Kravitz ND, Kusnoto B. Placement of mini-implants with topical anesthetic. J Clin Orthod 2006;40:602-4. 16. Morea C, Dominguez GC, Wuo AD, Tortamano A. Surgical guide for optimal positioning of mini-implants . J Clin Orthod 2005;39:317-21. 17. Maino BG, Weiland F, Attanasi A, Zachrisson BU, Buyukilmaz T. Root damage and repair after contact with miniscrews. J Clin Orthod 2007;41:762-6. 18. Moon CH, Lee DG, Lee HS, Im JS, Beak SH. Factors associated with the success rate of orthodontic miniscrews placed in the upper and lower posterior buccal region. Angle Orthod 2008;71:101-6. 19. Reynders R, Ronchi L, Bipat S. Mini-implants in orthodontics: A systematic review of the literature. Am J Orthod Dentofacial Orthop 2009;135:564.e1-19. 20. Park HS, Lee SK, Kwon OW. Group distal movement of teeth using microscrew implant anchorage. Angle Orthod 2005;75:602-9. 21. Viwattanatipa N, Thanakitcharu, S, Uttraravichien, A, PitiphatW. Survival analyses of surgical miniscrews as orthodontic anchorage. Am J. Orthod Dentofacial Orthop 2009;136:29-36.